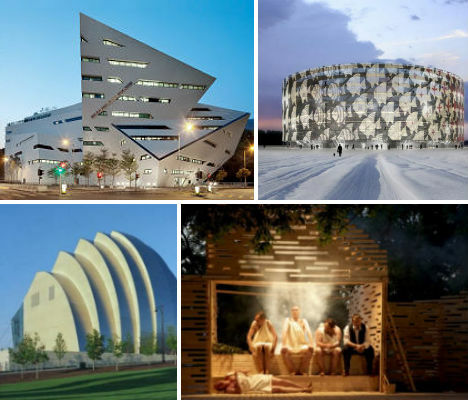 A modern take on the Roman Colosseum, an abstracted wood backdrop and a recycled pop-up theater in London are among the many diverse 21st-century auditoriums that are currently being built around the world. 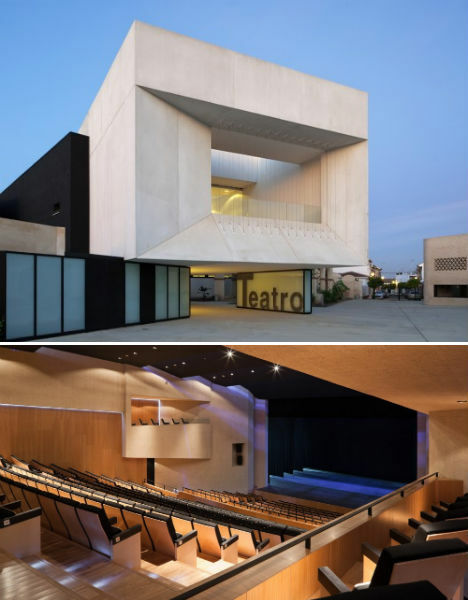 These modern theater designs entice the community, providing open and active performance spaces that connect the public to art and culture. 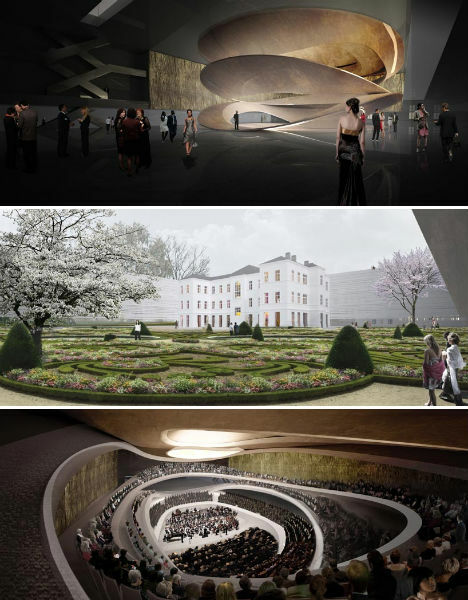 The winning design for the new Sinfonia Varsovia Concert Hall in Warsaw, Poland, which features an internal performance space that fittingly calls to mind the delicate biology of the human inner ear, was created by Atelier Thomas Pucher. 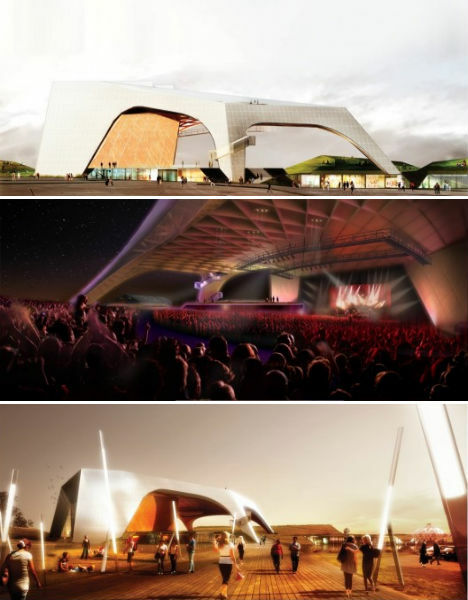 Making use of existing vacant buildings and a park, the new site includes a 1,800-seat symphonic hall, rehearsal areas, merchandise facilities, musical workshops and a small hotel; it’s ringed by a ‘floating wall’ which, the architect explains, helps to create a sense of drama and expectation upon entering. 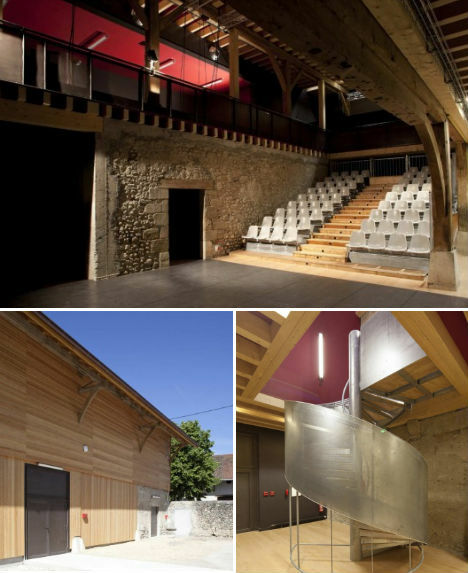 Deftly combining crumbling 16th century farm buildings with the sleekness of modern architecture, Clermont Architectes have helped to turn an agricultural property that once belonged to Voltaire into a stunning performance space. The Theatre du Châtelard was first created in 1991 and has now been renovated to contemporary standards while retaining the building’s character. 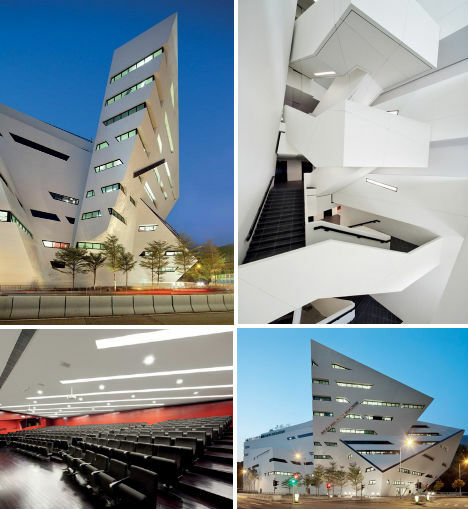 The City University of Hong Kong has a new media center designed by Daniel Libeskind, which will be opening in October 2011. The Run Run Shaw Creative Media Center houses theaters, labs and classrooms for the school’s computer engineering and media technology departments. 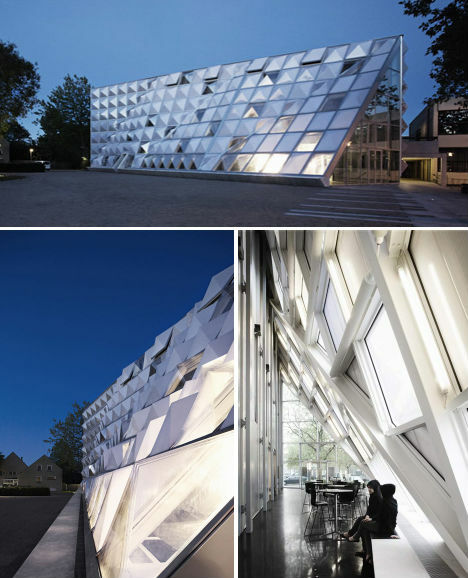 Jutting geometric volumes characterize the exterior, and the interior is similarly dynamic in black, white and red. 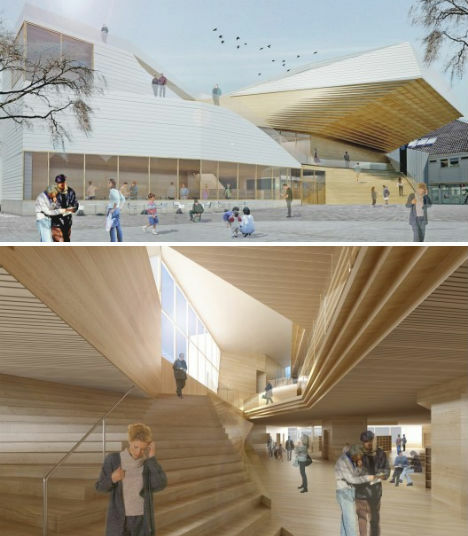 Recently approved for construction on the waterfront in southern Norway is the Flekkefjord Cultural Center. Helen & Hard architects have designed a soaring white-and-wood structure that incorporates a theater hall, cinema, gallery, library, youth club and cultural school. Each of the functions of the center were divided into four individual “houses” that are connected by a continuous stairway and numerous gathering spaces. A large temporary theater styled after the ancient Roman Colosseum will be built on a large stretch of lawn along the entrance to The Hague in South Holland. Cepezed Architects have been commissioned to produce the project, which will consist of scaffolding covered in stretched fabric printed with artist M.C. Escher’s Metamorfosis. 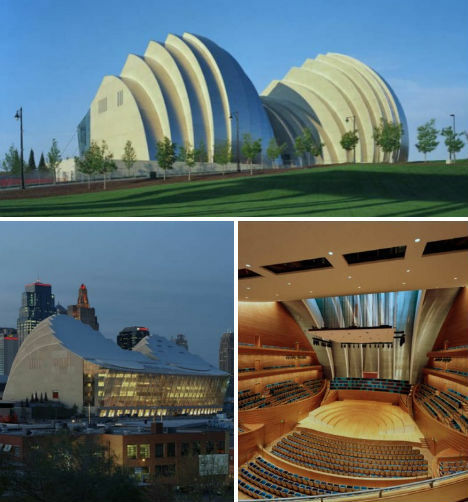 Concerts, performances, exhibitions and fairs will be held inside for an audience of up to 5,000. 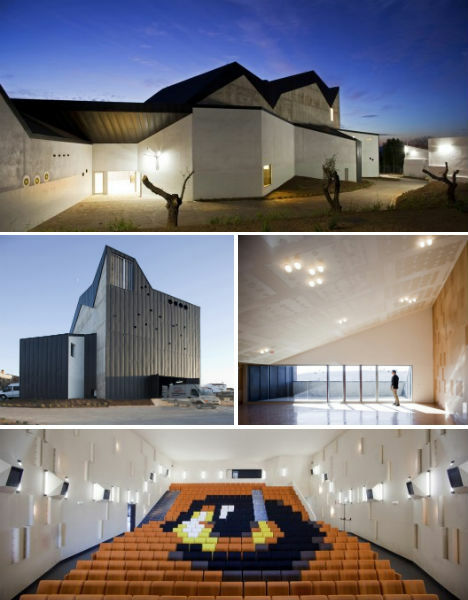 An irregular plot required some ingenuity on the part of Enrique Krahe architects when designing the Municipal Theater of Zafra in a small Spanish town. The architects responded with a sprawling layout punctuated with gardens, with gently sloped interiors that allow full accessibility for visitors. 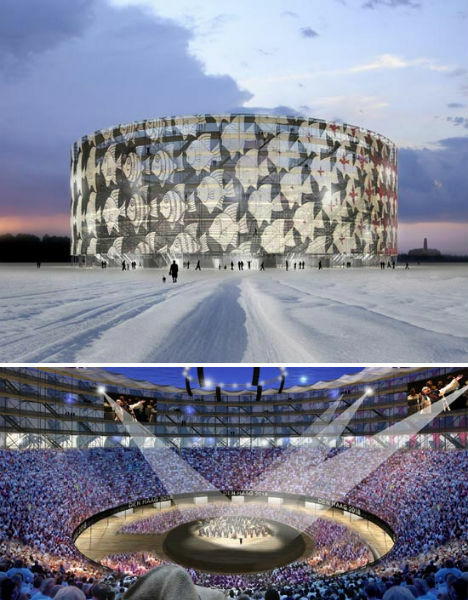 They explain that they wished to “challenge the traditional role of spectators as passive ingredients”, symbolizing this with an ‘all-seeing eye’ rendered in a pixelated fashion by the colors of the seats. Believed to be the only professional theater in Europe to be located in such a small town, the Rakvere theater was founded in 1882 and continues to be very active and popular. 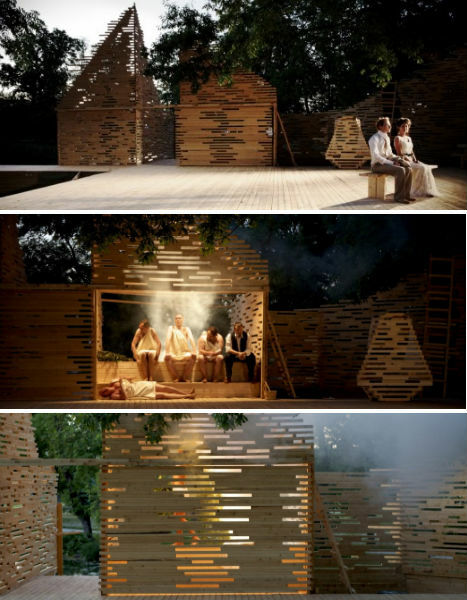 In the summer months, the plays take place outdoors, and this year, the theater has a beautiful new modern backdrop designed by Kadarik Tüür Arhitektid. An abstraction that provides a subtle environment even for period plays, the perforated wooden design frames the landscape of the park and allows for dramatic lighting at night. 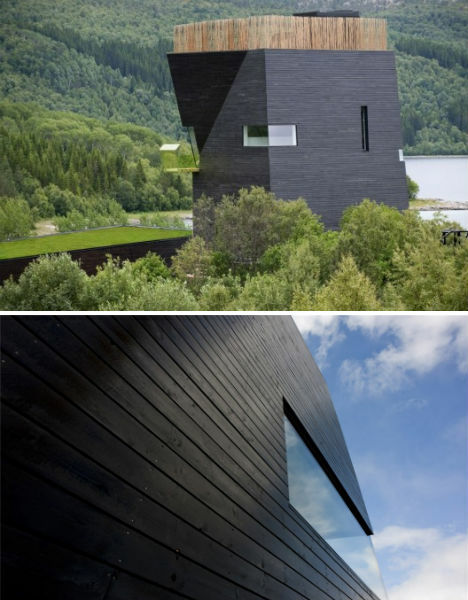 Containing exhibition areas, a library, a reading room and a cafe in addition to an auditorium, the Knut Hamsun Center in Hamarøy, Norway was designed by Steven Holl Architects with the idea of a “building as a body”. The black wood exterior pulls in elements of Norse churches, and long grass on the roof garden pays tribute to traditional green roofs of the nation. 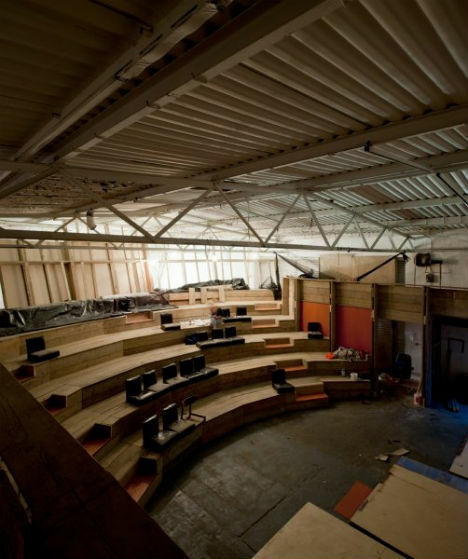 Perhaps it’s not as grand as many of these other modern theaters, but The Yard Theater in London’s Hackney Wick borough stands as an interesting example of some of the ways in which small community theaters are evolving. This pop-up theater and cafe/bar was made using recycled and reclaimed materials in a vacant warehouse, and will be up until October 2011. The Yard provides opportunities for emerging artists who otherwise might not have a place in London, offering free rehearsal and performance space.